From the small town of Bainbridge, head south down the Carpley Green Road. Less than a mile before the end, look to the west-facing slope of Addlebrough Hill and this huge Devil’s Stone can be seen resting halfway up the slope. There’s a lot of archaeology round here that aint in the books. We’ve come across some intriguing stuff of late, which you’ll read about soon enough. One legend tells that long ago Addlebrough was the home of a great unnamed giant — but a friendly giant by all acounts. However, one day the devil turned up and wanted possession of the giant’s hill and so a fierce row broke out between them. Perched on the top of the crag — which is the rough ridge to the west of here — the giant who lived here hurled huge boulders down at the devil, but they fell short and landed at the side of Lake Semerwater (itself an important spot in local prehistory). In return, Old Nick himself began throwing boulders back — and one of those which the devil threw landed here, halfway up the western flank of Addlebrough Hill (a couple of the large granite boulders which the giant threw can be seen on the edge of Semerwater and are known as the Carlow and Mermaid stones). Hence it’s name of the Devil’s Stone! 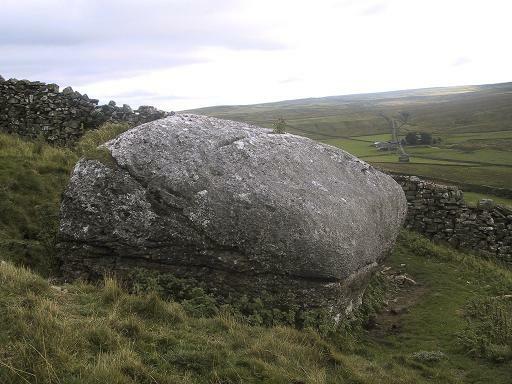 In Edmund Bogg’s Richmondshire (1908), he told how, “the curious markings on (the Devil’s Stone) are accounted due to the pressure of the devil’s fingers” which were caused when he threw this giant stone from somewhere to here. This entry was posted in Brigantia (Northern England), Sacred Nature, Yorkshire, North and tagged Addlebrough, Askrigg, Bainbridge, Countersett, creation myths, folk-lore, folklore, giants, legends, North Yorkshire, Stalling Busk, Thornton Rust, Uredale, Worton, Yoredale. Bookmark the permalink.